Mission: SPACE is meant to simulate astronaut training for the first manned mission to Mars aboard the fictional X-2 Deep Space Shuttle on the 75th anniversary of man’s first mission into space. You’ll enter the attraction as a “trainee” at the fictional International Space Training Center, where you’ll be arranged into 4-person crews before watching an introduction video starring Gary Sinise (who starred in the popular films “Apollo 13” and “Mission to Mars”). Before you begin the Mission: SPACE experience, you’ll need to decide whether you want to be on the Green Team or the Orange Team. The Green version of the attraction is a much less intense experience. The vehicle doesn’t spin, so you won’t feel forces up to 2.4G. If you’re prone to motion sickness, this one’s for you. Instead of simulating astronaut training for the first manned mission to Mars (like the Mission: SPACE Orange version), you'll fly around Earth's orbit. While making your way through the queue, you’ll enter the “Sim Lab.” Here, you’ll see a rotating wheel with chambers that simulates gravity and a Lunar Rover before traveling into the Command Room. In the Command Room, notice the plaques on the wall praising space travel accomplishments, such as the First Man in Space, First Man on the Moon and more. Before boarding the simulators, each “trainee” chooses an onboard role (navigator, pilot, commander or engineer) and is given two tasks to perform during the mission. You’ll go through orientation and flight training before embarking on your space mission. The mission starts with the launch countdown and your seat tilting back into the launch position as you blast off into the sky. During this portion of the ride, you’ll experience intense G Forces, while your shuttle escapes the Earth’s gravity. During your journey, you’ll experience weightlessness, rocket around the moon and even experience a brief period of simulated hyper sleep. Be sure to pay attention to your chosen task! After you’ve landed on Mars and completed the mission, you can head over to the Advanced Training Lab and try your hand at more space-themed missions. 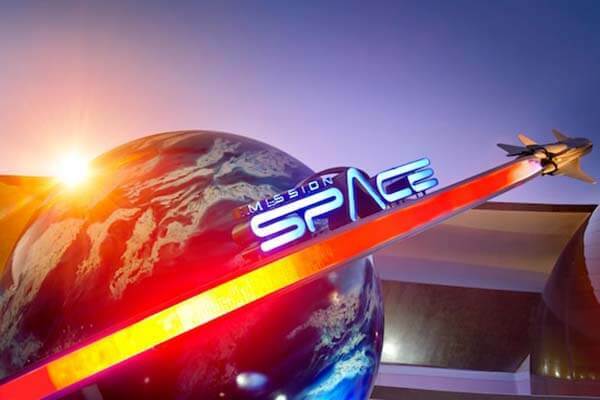 Mission: SPACE is an indoor motion simulator ride located in Future World East at Epcot®. The duration of the simulated flight is about 4 ½ minutes. The entire experience counting the pre-show takes about 15 minutes. Mission: SPACE is experienced in groups of four, which each guest in his/her own individual seat. Each seat has a pull-down shoulder restraint. Guests must transfer from motorized scooter or ECV to an available wheelchair, then from the wheelchair to the attraction/ride vehicle. Video captioning is available at this attraction. Due to the nature of Mission: SPACE, service animals are not permitted. Also located in the Mission: SPACE pavilion is the Mission: SPACE Advanced Training Lab, an interactive play space featuring space-themed exhibits and games. Go within the first two hours after Epcot® opens or wait until later in the evening when many of the park’s guests are across the lagoon in World Showcase. Mission: SPACE is a headlining attraction so lines can be long by midday. 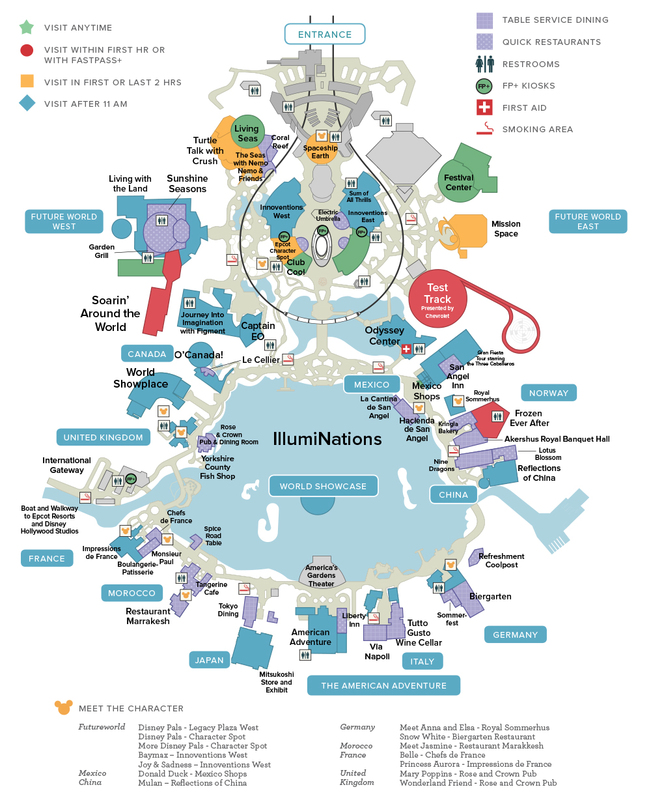 Consider using a FastPass+ for Mission:SPACE. Definitely go on the Green version of Mission: SPACE or skip it altogether if you are prone to motion sickness. This version was redone in 2017 and was even more less intense and family friendly. If you skip the ride altogether, you can wait for the rest of your group in the air-conditioned play space in the pavilion, Mission: SPACE Advanced Training Lab. And obviously, it is not recommended to go on Mission: SPACE right after eating or on an empty stomach - try going when you’ve had a light meal about 1 or 2 hours beforehand. 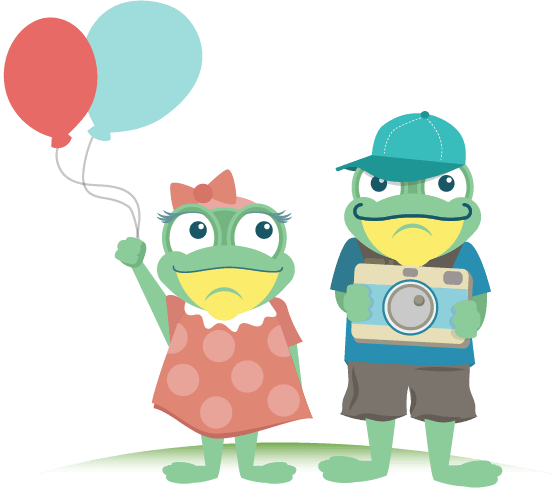 Parents beware - the point at which the 4-person team must decide on roles can be quite contentious if you haven’t prepared your little ones beforehand. Assign the roles ahead of time! Mission: SPACE opened on October 1, 2003. The attraction went through a refurbishment in 2017 to make the Green version even more family friendly. To develop the story and design of Mission: SPACE, Walt Disney Imagineers worked with more than 25 space experts from both NASA and the Jet Propulsion Laboratory, including 5 astronauts. These 5 astronauts took part in NASA missions including Mercury, Gemini, Apollo, the space shuttle program and the International Space Station. The X-2 Deep Space Shuttle used in the attraction’s mission is a three-stage rocket and uses technologies like aerospike engines, solid hydrogen fuel, carbon nanotubes and an aerobrake. The Lunar Rover in the Sim Lab is an authentic rover on loan from the Smithsonian in Washington, D.C.